Presidential election results map. 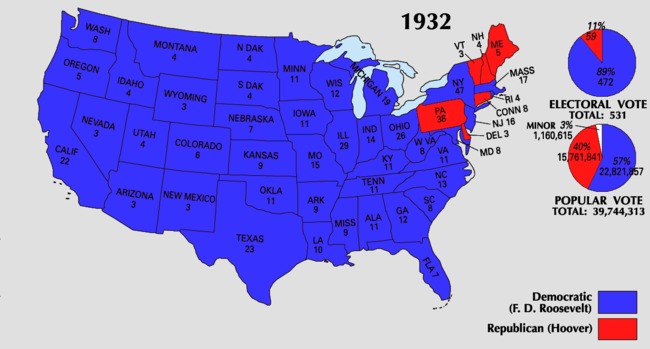 Blue denotes those won by Roosevelt/Garner, red denotes states won by Hoover/Curtis. Numbers indicate the number of electoral votes allotted to each state. As the year 1932 began, the Republican Party believed Hoover's protectionism and aggressive fiscal policies would solve the depression. 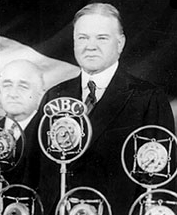 Whether they were successful or not, President Herbert Hoover controlled the party and had little trouble securing a re-nomination. 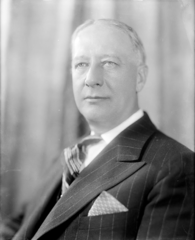 Little-known former United States Senator Joseph I. France ran against Hoover in the primaries, but Hoover was often unopposed. France's primary wins were tempered by his defeat to Hoover in his home state of Maryland and the fact that few delegates to the national convention were chosen in the primaries. Hoover's managers at the Republican National Convention, which met in Chicago between June 14 and 16, ran a tight ship, not allowing expressions of concern for the direction of the nation. He was nominated on the first ballot with 98% of the delegate vote. 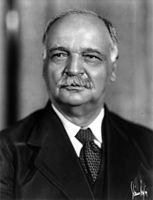 Both rural Republicans and hard-money Republicans (the latter hoping to nominate former President Calvin Coolidge) balked at the floor managers and voted against the renomination of Vice-President Charles Curtis, who won with just 55% of the delegate votes. On the first three ballots Roosevelt had well over a majority of the delegate vote, but still lacked the two-thirds majority. 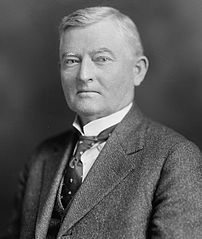 Before the fourth ballot, his managers James Farley and Louis McHenry Howe struck a deal with House Speaker John Nance Garner: Garner would drop out of the race and support Roosevelt, and in return Roosevelt would agree to name Garner as his running mate. With this agreement, Roosevelt won the two-thirds majority and with it the presidential nomination. After making an airplane trip to the Democratic convention, Roosevelt accepted the nomination in person. In his speech, he stated, "ours must be a party of liberal thought, of planned action, of enlightened international outlook, and of the greatest good to the greatest number of our citizens." Roosevelt's trip to Chicago was the first of several successful, precedent-making moves designed to make him appear to be the candidate of change in the election. Large crowds greeted Roosevelt as he traveled around the nation; his campaign song "Happy Days Are Here Again" became one of the most popular in American political history:244 – and, indeed, the unofficial anthem of the Democratic Party. The Democrats were united as they had not been in 1928, and probably the most united the party had been in the entire Fourth Party System. Roosevelt's Protestant background nullified the anti-Catholic attacks Smith faced in 1928, and The Depression seemed to be of greater concern among the American public than previous cultural battles. Prohibition was a favorite Democratic target, with few Republicans trying to defend it given mounting demand to end prohibition and bring back beer, liquor, and the resulting tax revenues. 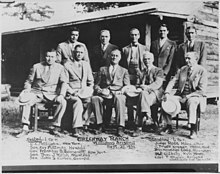 Roosevelt (seated, center) at Greenway Ranch in Williams, Arizona on September 26, 1932. He is accompanied by U.S. Senator from Arizona Carl Hayden standing far right, along with –among others –three Democrats from the U.S. Senate (seated): Pittman, Walsh, and Cohen. 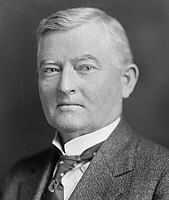 In contrast, Hoover was not supported by many of the more prominent Republicans and violently opposed by others, in particular by a number of senators who had fought him throughout his administration and whose national reputation made their opposition of considerable importance. Many prominent Republicans even went so far as to espouse the cause of the Democratic candidate openly. Making matters worse for Hoover was the fact that many Americans blamed him for the Great Depression. For more than two years, President Hoover had been restricting trade and increasing taxes on the wealthy with legislation such as the Smoot–Hawley Tariff Act and the Revenue Act of 1932. As Governor of New York, Roosevelt had garnered a reputation for promoting government help for the impoverished, providing a welcome contrast for many who saw Hoover as do-nothing president. Roosevelt also attacked Hoover for being, "the greatest spending Administration in peacetime in all our history." The outrage caused by the deaths of veterans in the Bonus Army incident in the summer of 1932, combined with the catastrophic economic effects of Hoover's domestic policies, reduced his chances of a second term from slim to none. His attempts to campaign in public were a disaster, as he often had objects thrown at him or his vehicle as he rode through city streets. 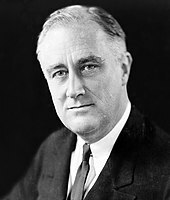 During the campaign, Roosevelt ran on many of the programs that would later become part of the New Deal during his presidency. It was said that "Even a vaguely talented dog-catcher could have been elected president against the Republicans." Hoover even received a letter from an Illinois man that advised, "Vote for Roosevelt and make it unanimous." Hoover called Roosevelt a "chameleon in plaid" and Roosevelt called President Hoover a "fat, timid capon". In the last days of campaigning, Hoover criticized Roosevelt's "nonsense ... tirades ... glittering generalizations ... ignorance" and "defamation". The election was held on November 8, 1932; however Maine held separate state elections in September. Results by county explicitly indicating the percentage for the winning candidate. Shades of blue are for Roosevelt (Democratic), shades of red are for Hoover (Republican), grey indicates zero recorded votes and white indicates territories not elevated to statehood. This was the first election since 1916 (16 years earlier) in which the Democratic candidate won. Although the "other" vote (the combined vote total for candidates other than the nominees of the two major parties) of 1932 was three times that of 1928, it was considerably less than what had been recorded in 1920; the time of the greatest "other" vote with the exception of the unusual conditions prevailing in 1912 and 1924. Roosevelt, the Democratic candidate, won the support of 22,817,883 voters (57.41%), the greatest vote ever cast for a candidate for the Presidency up until that time, and 1,425,000 greater than that cast for Hoover four years earlier. It is to be noted that Hoover won a greater percentage of the vote in 1928, as did Harding in 1920. But the national swing of 35.17% impressed all who considered the distribution of the vote, and indicated that more than one-sixth of the electorate had switched from supporting the Republican Party to the Democratic Party. Only once in this period had there been a comparable shift; in 1920, there was a 29.29% swing towards the Republicans. The swing from Smith in 1928 to Roosevelt in this year remains the greatest national swing of the electorate between presidential elections in the history of the United States. 1932 was a realigning election, as Roosevelt won a sweeping victory over Hoover, with Democrats extending their control over the U.S. House and gaining control of the U.S. Senate. Twelve years of Republican leadership came to an end, and 20 consecutive years of Democratic control of the White House began. Until 1932, the Republicans had controlled the Presidency for 56 of the previous 72 years, dating to Abraham Lincoln's election in 1860. After 1932, Democrats would control the Presidency for 28 of the next 36 years. Roosevelt led the poll in 2,722 counties, the greatest number ever carried by a candidate up until that time. Of these, 282 had never before been Democratic. Only 374 remained loyally Republican. It is to be noted, however, that half of the total vote of the nation was cast in just eight states (New York, New Jersey, Pennsylvania, Ohio, Illinois, Indiana, Michigan, and Wisconsin) and that in these states, Hoover polled 8,592,163 votes. In one section (West South Central), the Republican percentage sank to 16.21%, but in no other section did the party poll less than 30% of the vote cast. However, the relative appeal of the two candidates in 1932 and the decline of the appeal of Hoover as compared with 1928 are shown in the fact that the Republican vote increased in 1932 in only 87 counties, while the Democratic vote increased in 3,003 counties. The great vote cast for Hoover, and the fact that in only one section of the nation (West South Central) did he have less than 500,000 votes and in only three states outside of the South less than 50,000 votes, made it clear that the nation remained a two-party electorate, and that everywhere, despite the triumph of the Democrats, there was a party membership devoted to neither the new administration nor the proposals of the Socialist candidate who had polled 75% of the "other" vote (as well as the highest raw vote total of his campaigns). This election marks the last time a Republican presidential candidate won a majority of black and African-American votes. As New Deal policies took effect, the strong support of black voters for these programs began a transition from their traditional support for Republicans to providing solid majorities for Democrats. 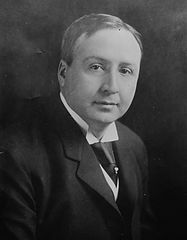 The Roosevelt ticket swept every region of the country except the Northeast and carried many reliable Republican states that had not been carried by the Democrats since their electoral landslide of 1912, when the Republican vote was divided. Michigan voted Democratic for the first time since the emergence of the Republican Party. Minnesota was carried by a Democrat for the first time in its history, leaving Vermont as the only remaining state never to be carried by a Democratic candidate (and it would not be until 1964). In contrast to the state's solid support of Republicans prior to this election, Minnesota continued supporting Democrats in every presidential election but three since 1932, the exceptions being 1952, 1956, and 1972. 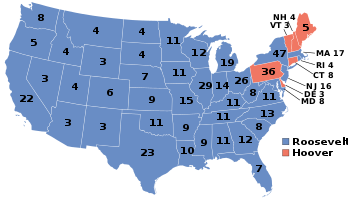 Roosevelt's victory with 472 electoral votes stood until the 1964 victory of Lyndon B. Johnson, who won 486 electoral votes in 1964, as the most ever won by a first-time contestant in a presidential election. Roosevelt also bettered the national record of 444 electoral votes set by Hoover only four years earlier, but would shatter his own record when he was re-elected in 1936 with 523 votes. This was the last election in which Connecticut, Delaware, New Hampshire, and Pennsylvania voted Republican until 1948. Source (popular vote): Leip, David. "1932 Presidential Election Results". Dave Leip's Atlas of U.S. Presidential Elections. Retrieved July 31, 2005. Source (electoral vote): "Electoral College Box Scores 1789–1996". National Archives and Records Administration. Retrieved July 31, 2005. ^ a b c Neal, Stephen (2010). Happy Days Are Here Again: The 1932 Democratic Convention, the Emergence of FDR--and How America Was Changed Forever. HarperCollins. ISBN 9780062015419. ^ "Address Accepting the Presidential Nomination at the Democratic National Convention in Chicago". The American Presidency Project. Retrieved November 24, 2017. ^ The Election of 1932 – Franklin D. Roosevelt and the First New Deal. Boundless.com. Retrieved on July 14, 2013. ^ Leuchtenberg, William E. (2009). Herbert Hoover. Times Books. pp. 138–139. ^ "Overall Unemployment Rate in the U.S. Civilian Labor Force, 1920–2007 – Infoplease.com". Infoplease.com. Retrieved November 4, 2008. ^ "Timeline of the Great Depression". Hyperhistory.com. Retrieved November 4, 2008. ^ Rauchway, Eric (2019). "The New Deal Was on the Ballot in 1932". Modern American History: 1–13. doi:10.1017/mah.2018.42. ISSN 2515-0456. ^ Cambell, Jeff (November 19, 2008). "Hoover's Popularity". Lonely Planet. ^ a b c Gibbs, Nancy (November 10, 2008). "When New President Meets Old, It's Not Always Pretty". TIME. ^ "1932 Presidential General Election Data – National". Retrieved April 8, 2013. Burns, James Macgregor. Roosevelt the Lion and the Fox (1956) online pp 123–52. Eden, Robert. "On the Origins of the Regime of Pragmatic Liberalism: John Dewey, Adolf A. Berle, and FDR's Commonwealth Club Address of 1932." Studies in American Political Development (1993) 7#1 pp: 74-150. Wikimedia Commons has media related to United States presidential election, 1932. This page was last edited on 22 April 2019, at 18:18 (UTC).